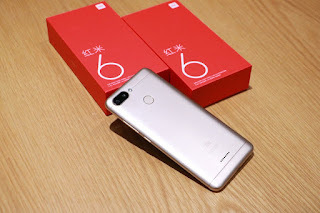 Xiaomi recently launched Redmi 6 Series Redmi 6A, Redmi 6 and Redmi 6 Pro in China now according to report Xiaomi to launch Redmi 6 and Redmi 6A in India in September. Xiaomi Redmi 6A comes with a 5.45-inch (1440 × 720 pixels) HD+ 18:9 2.5D curved glass display powered by 2GHz Quad-Core MediaTek Helio A22 12nm processor. It has a 2GB of RAM and 16GB of internal storage. On Camera, it has a 13MP Rear Camera and 5MP front Camera packed with a 3000mAh Battery. Xiaomi Redmi 6 has a 5.45-inch HD+ display which is an 18:9 panel powered by MediaTek Helio P22 SoC processor with 3/4 GB of RAM and 32/64GB of internal storage. On Camera, it has a 12+5MP dual camera setup and 5MP front Camera packed with a 3000mAh Battery. Xiaomi Redmi 6A is priced at 599 yuan. Xiaomi Redmi 6 is priced at 799 Yuan for 3GB of RAM and 32GB of internal storage and 4GB RAM and 64GB of internal storage cost 999 Yuan.